In 1985, I was at the heart of my baseball card collecting years. Fun Foods upped the baseball card collecting ante a bit by capitalizing on the popularity of pins/buttons worn on the jean jackets of every red-blooded American kid. 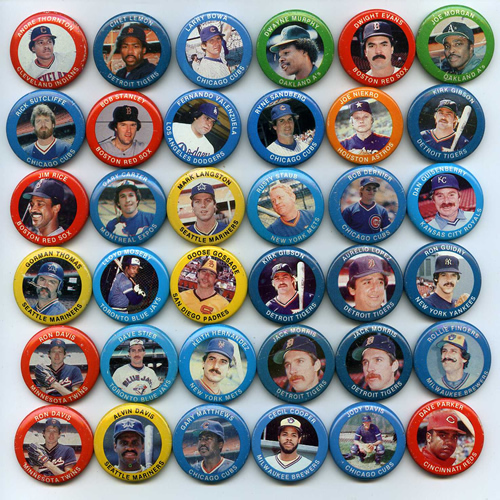 Packages of these baseball pins could be found at a local discount grocery store -- 133 pins in all. Below is the extent of my Fun Foods pin collection. As I sorted through them, I found it interesting to see how many of the superstars of yesterday are still involved in the game today. Some are or have been managers: Bowa. Some are coaches: Murphy, Gibson. Some are arrogant broadcasters: Morgan. Some are occasionally drunk broadcasters: Sutcliffe. Some have guest-starred on Seinfeld: Hernandez. Some are slated to become the managerial savior of the Chicago Cubs: Sandberg. And, sadly, some are no longer with us: Niekro (brain aneurysm), Quisenberry (brain cancer), Lopez (auto accident).